I thought it would probably be good to give my seldom-used ski muscles a rest after Columbia, so I drove south to Lake Louise to play tourist for a day. I even treated myself to some Montreal Smoked Meat, which is a bit like pastrami without the pepper coating, and only seems to be sold in Canada. 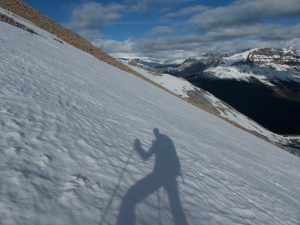 Since I prefer “fitness tourism,” I looked around for an easy peak, and settled on Mount Fairview, a 1000-meter trail climb from Lake Louise. 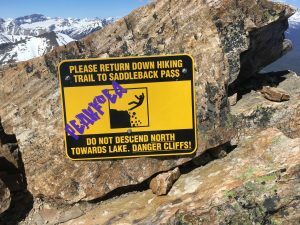 The lake was still slightly frozen, and the trail was snow-covered from the beginning, but Canadian tourists are a hardy lot, so there was a good boot-pack most of the way to the saddle between Fairview and Saddleback. Near the end of the bootpack, I met a half-dozen college kids, including a couple girls in short-shorts, debating whether to continue. I made some encouraging noises, but I don’t think they went much farther, which was probably for the best. The last half-mile or so to the saddle was fairly wretched, with stretches of crotch-deep postholing through slush. I tried a direct line toward the peak, failed, then continued up the bottom of the depression farther toward the saddle, where the snow was slightly more consolidated. Fortunately, there was a bare rib leading from the saddle nearly to the summit — I would not have had the energy or patience for another 1500 vertical feet of wallowing. 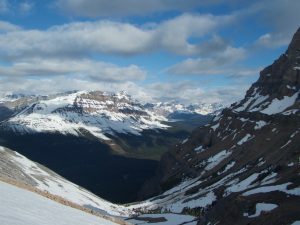 The view is actually better than “fair,” with Lake Louise below, and greater peaks to the south, west, and north: Temple, some of the Ten Peaks including Deltaform, Sheol, Lefroy, and Victoria. Having nothing better to do, I sat in a sheltered spot on the summit for awhile, then returned the way I had come. The snow was even worse than on the way up, sometimes even too soft for a sitting glissade, but at least it was downhill. I passed another group of kids, these at least all wearing long pants, and encouraged them to try for the summit before skating down the icy trail through the woods to the teeming hordes of tourists by the chateau. What a difference a week makes. When I first tried Hector seven days ago, there was (awful) snow almost right from the road, and I was almost completely dysfunctional with the flu. Today, I was able to hike the first 600 meters or so (to above the waterfall) in trail runners, and finished a bit after noon. The previous night looked like the last cold night for awhile, and I was just about done with the area, so I figured I might as well stick around an extra day to finish Hector. It is one of the Canadian Rockies’ 11,000-foot peaks, an ultra-prominence peak, and best done as a ski, so it would have been lame of me to leave it un-bagged while I was in the area. I got a semi-alpine start around 6:20, finding two other cars parked in the small pullout across from Hector Creek. It took me a few minutes to adjust to my new dimensions with both skis and boots on my back, but I was soon making steady progress up the good use trail toward the waterfall without getting stuck on trees. Below the waterfall, I climbed a cone of avalanche snow, then a little third class cliff. After a few more minutes of trail, I reached nearly-continuous snow in the hanging valley around 2200 meters. I skinned up the lousy snow, then stumbled across 50 yards of rocks to reach the continuous snow to the summit. The snow below the Hector Glacier was steep enough to require some boot-packing, but fortunately it was early enough for it not to have turned awful. Above, it was low-angle enough for efficient skinning. Rounding the corner, I finally got a glimpse of the well-hidden summit, and spotted a team of four on the upper glacier. They had taken a line well to the left, but it looked like most skiers followed a lower-angle line to the right. 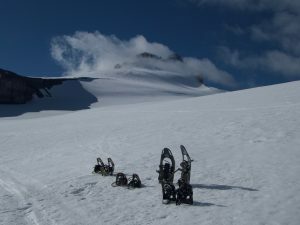 At the base of the glacier, I passed their four pairs of snowshoes, their tails stuck in the snow next to a red-flagged wand. 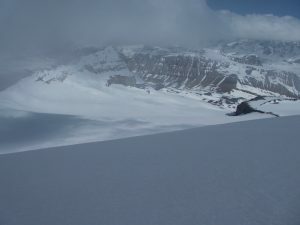 There were scattered clouds wandering slowly eastward, and as I reached the upper glacier, one of them parked on Hector. I wasn’t about to get lost — I had a map and GPS, and there were old tracks — but it was a bit annoying to climb with no visibility, and would be downright unpleasant to ski down in those conditions. I plodded on, eventually finding the party of four’s boot-pack, though I neither heard nor saw them descending. I stashed my skis and poles below the summit knob, then took on the final 100 feet of rock, ice, and snow with my axe and no crampons. I had them in my pack, but it would have taken time to adjust them to my ski boots, and this made the climb a bit more of a fair fight. I finally spotted the group of four descending the snow above the lower rock step. They turned out to be three novices and (probably) a guide, roped together and moving slowly. It seems like they had been going at a leisurely pace all day, since they had started around 3:30. I booted past them, then climbed a final 6-foot rock step to the summit, becoming slightly more comfortable climbing in plastic boots. This entry was posted in Canada, Skiing, Tourism. Bookmark the permalink. Looks awesome Sean! You’ll have to come back and we’ll ski this one in early April! I don’t think it’ll ever get old!